Here is something you don’t see very often, especially within the hobby today. The increase in price of a modern day card that isn’t related to some 18 year old prospect that was just bumped up to the majors. 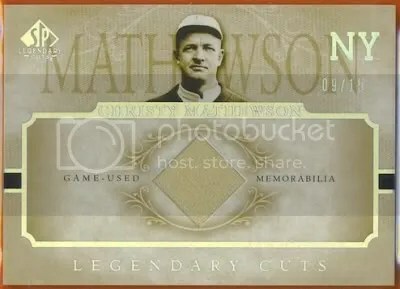 Christy Mathewson relic cards have been on the rise over the past few years. 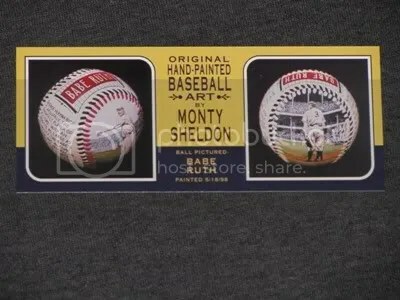 His first memorabilia card was issued in 2001 Upper Deck Legends of NY, and was limited to only 63 copies. After that, Mathewson had relics appear in other products such as 2003 Upper Deck SP Legendary Cuts, 2005 Upper Deck SP Legendary Cuts, 2005 Upper Deck Trilogy, and last came in 2007 Upper Deck Sweet Spot Classic. Since he has not had a new relic card issued in almost 5 years, the demand for his relics has drastically increased. 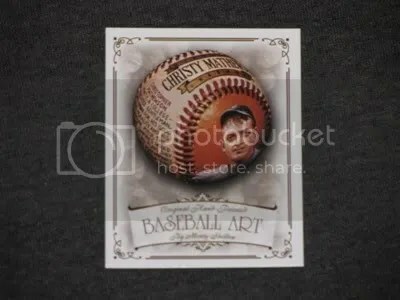 Christy Mathewson is a perfect example of what can happen when manufacturers stop making relic cards of a popular HOFer. 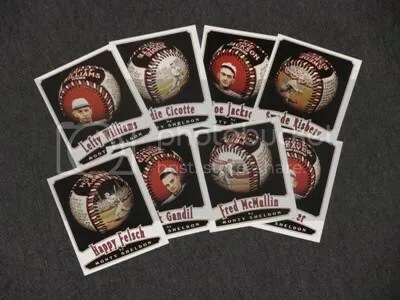 Among the first five inductees into the Baseball Hall of Fame, Mathewson has the second fewest relic cards. Walter Johnson would be first considering he doesn’t have any. Mathewson relics have really dried up. It looks as if all the collectors that purchased his relics are keeping them in their personal collection. 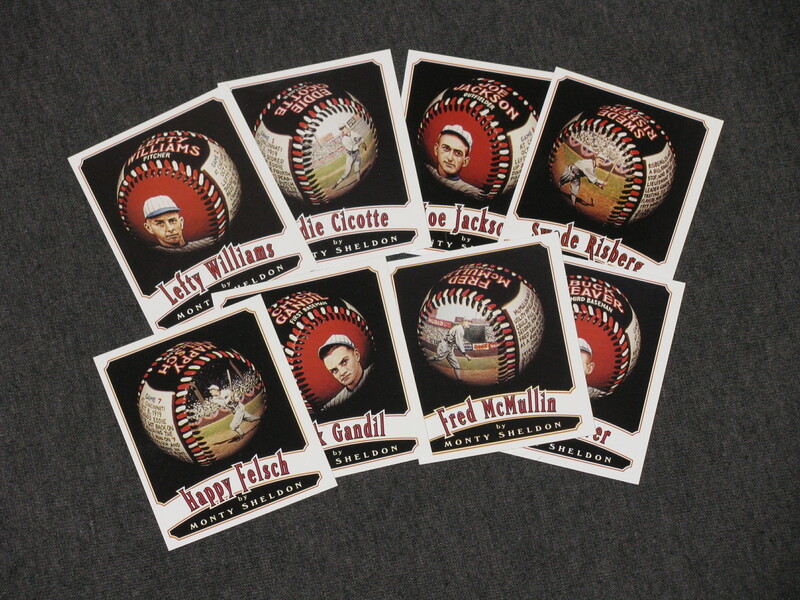 I don’t know if I’d like to see some new Mathewson relics hit the market. Someone would have to get their hands on some more Mathewson relics first, and those aren’t the easiest to find. If new ones were to be issued, I have a feeling they would drive the price down on the older ones. Mathewson’s 373 career wins still sits atop the number one spot in the National League, along with Grove Cleveland Alexander. He attended Bucknell University which is only a few minutes away from where I live. His body is also buried in the Lewisburg Cemetery and is right next to the college. This card basically wakes up in the morning and pisses excellence. 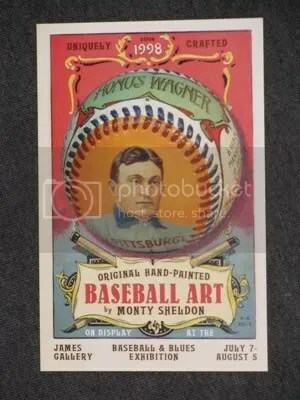 I think this is one of Mathewson’s coolest looking modern day cards. There isn’t anything fancy about it. Just a plain mugshot of one of the greatest pitchers in baseball history. No, I’m not talking about cards worth a penny. I’m talking about cards containing pennies. A few years back I saw these cards on eBay but never gave much thought to them. 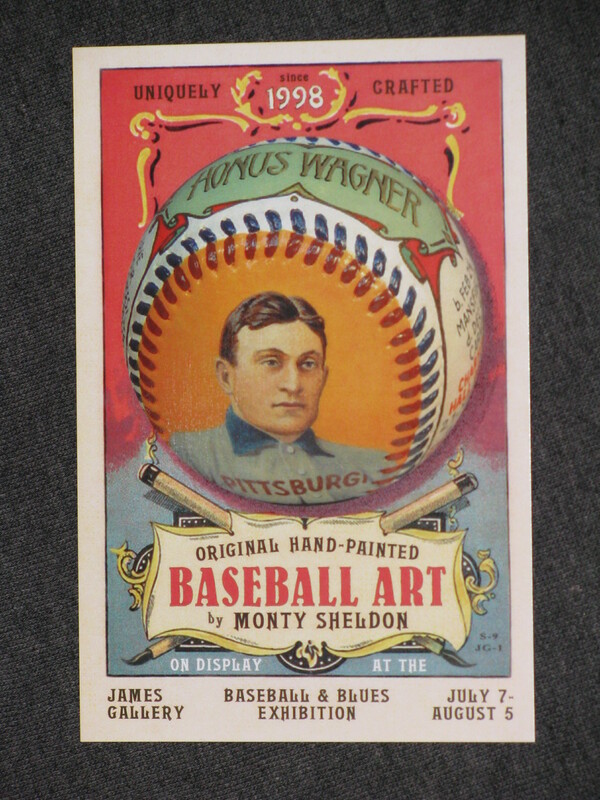 Recently I’ve been more interested in these cards which were made by Auth/Ink and always contain a penny. 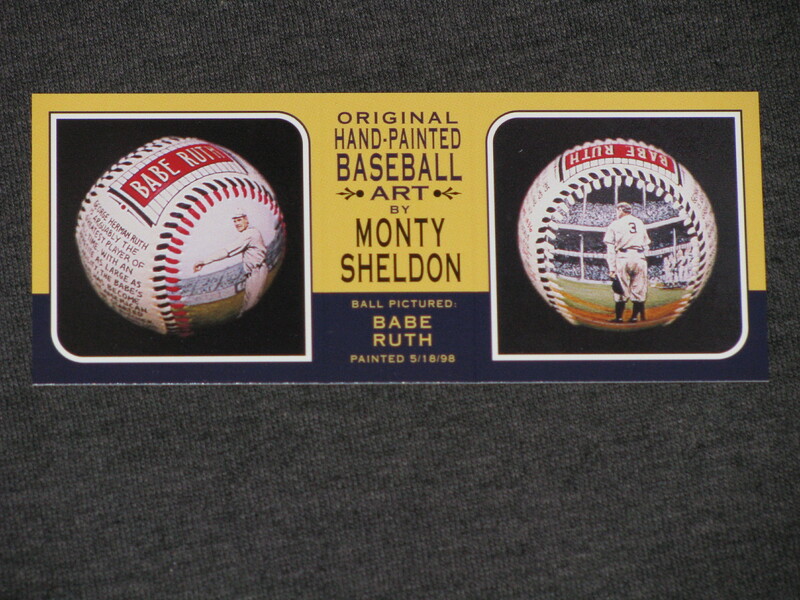 They always feature a famous athlete, entertainer, or historical figure and then have a penny inserted into the card from a year that was significant to that person. 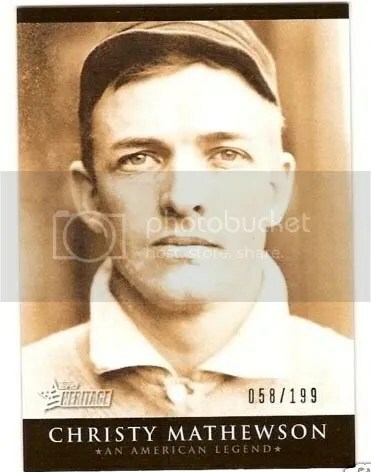 A couple of weeks ago I found a Christy Mathewson Auth/Ink card at a show for only $15.00. 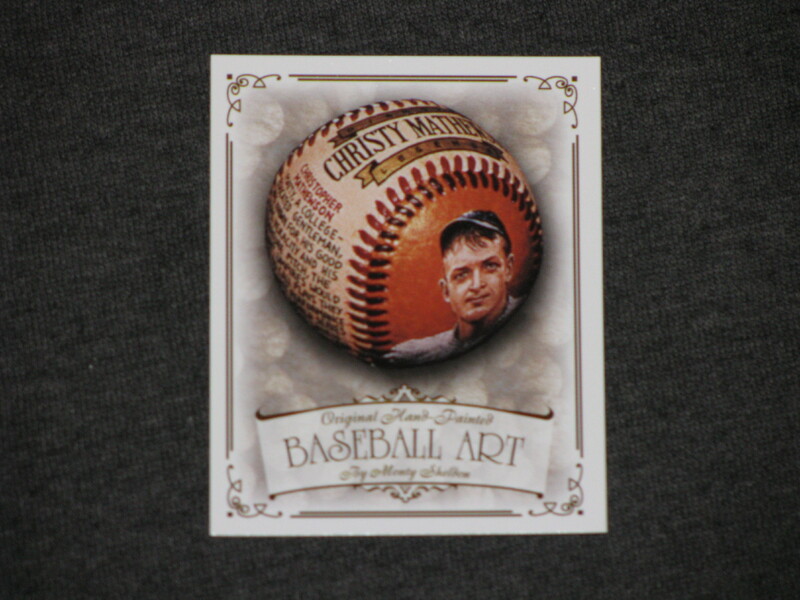 Inside the card is a wheat penny from 1936 because that was the year Mathewson was inducted into the Baseball HOF. 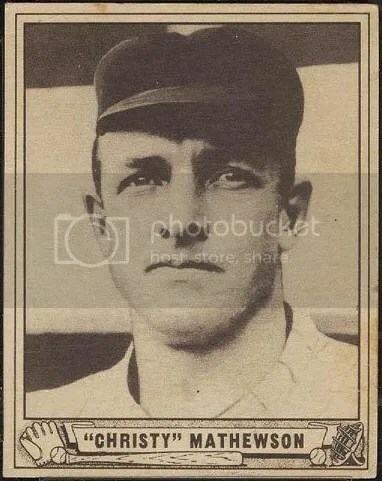 Since I collect cards of older players such as Mathewson, I knew I had to have it. Mathewson went to Bucknell University which I drive by everyday and is even buried the Lewisburg Cemetery which is right next to the school (that would make for a great place to do an on-location box break near Halloween). Nobody is quite sure how these cards were distributed. I doubt they were inserted into packs. I think Auth/Ink sold them exclusively in eBay just like Razor did with some of their Metal cards. These cards range in price from $9.99 all the way up to $50.00 in some cases. 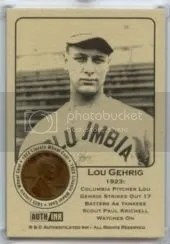 This Lou Gehrig card looks really cool. Usually you’d find Gehrig in a Yankees uniform, but they decided to use a picture of him in his Columbia jersey. Another one of my favorites is of Mike “King” Kelly.